Description: CSX Train Q646 at Kayne Ave. Description: H2W callls the signals for CP South Linden with its short train of seven cars and a CEFX leaser in the consist. Description: Another sunny weekend and another H2W. This time the H2W has four locomotives and seven cars including a NS scale test car. Description: Haven't seen too many bluebirds in Bristol. 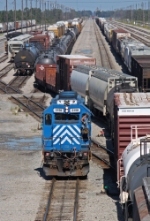 Description: Pair of CEFX SD40-2s in Birmingham, AL. Description: NS Northbound Local Freight Train AB10 doing some switching at Woodlawn, Al. Description: NS Northbound Local Freight Train AB10 doing some switching at 50th Street in Woodlawn, Al. Description: A pair of citibank units bring CSX interchange traffic by 21st street. Description: Citibank units run around their train on the NS in downtown Birmingham. Description: CEFX 3158 leads NS 173 south through Kannapolis, there is more blue on the unit than in the sky!!!! Description: CEFX lease unit part of an NS manifest heading east. 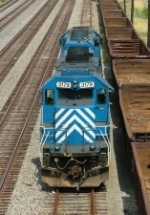 Description: CEFX TIED DOWN AT NS MONTVIEW YARD IN LYNCHBURG. Description: CEFX 3158 AND NS 5577 SIT TIED DOWN AT THE NS MONTVIEW YARD IN LYNCHBURG. Description: CEFX 3158 AND NS 5577 SITTING OUTSIDE THE SHOP AT THE YARD IN LYNCHBURG.